Veris is proud to announce the release of our 3rd annual Impact Report, highlighting the collective achievements of its clients, the Veris team, and the investment managers we work with. Among the milestones of the past year: Veris celebrated its 10th anniversary, reached $1 billion in client assets under management, and was named as a B Corporation Best for the World company for the sixth consecutive year. The 24-page report describes the environmental and social impact resulting from our clients’ collective investments in our five thematic areas: Climate Change & the Environment, Community Wealth Building & Social Equality, Sustainable Agriculture & Food Systems, Gender Lens Investing, and Mindfulness & Sustainability. The report also focuses on how Veris measures impact, both quantitatively and qualitatively. As part of our ongoing due diligence, we look at the role public companies, shareholder advocacy, private social enterprises, and community development solutions play in creating a more inclusive and sustainable economy. We’re pleased to note that we have seen great progress each year in terms of understanding and communicating the impact of portfolio companies. In 2017, impact reporting took a leap forward with the development of systems-level frameworks, such as the U.N. Sustainable Development Goals. 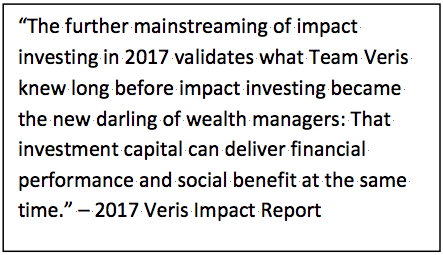 To encourage more common language in impact reporting, Veris also reports metrics established by the Global Impact Investing Network’s (GIIN) Impact Reporting and Investment Standards (IRIS). IRIS facilitates comparison and best practices, transparency, and accountability in impact measurement. What is also interesting about this year’s report is what it says about the positive direction of impact investing. We’re seeing increased momentum across the field – such as major commitments from conventional investors and growth of the Green Bond market and assets invested with a Gender Lens. If you haven’t seen our 2018 analysis of Gender Lens Investing, please feel free to download it here. We believe these trends validate what Veris clients and our team have recognized for a decade: that investors can align their wealth with their values. 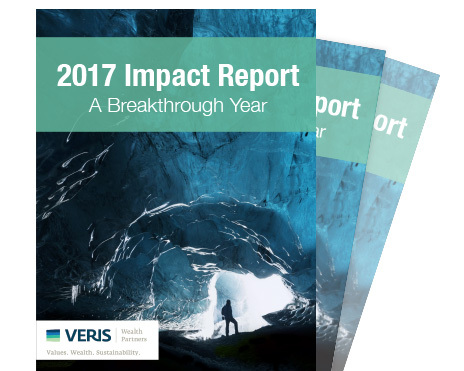 The 2017 Veris Impact Report demonstrates our commitment to delivering the most impactful investment opportunities and supporting the overall growth of sustainable and impact investing. We hope you will read our report, and we look forward to your feedback.